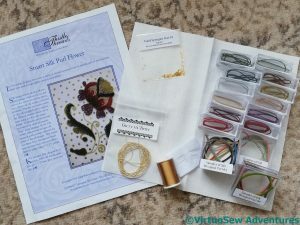 There’s a new course from Thistle Threads, concentrating on the use of silk-wrapped purl threads. It looked like fun, and it includes the bonus of some extra samples of different sizes and colours. I’m always trying to learn more about the more obscure and interesting corners of embroidery, and the reconstructions of no-longer-current threads and materials play directly into my fascination with early technologies. 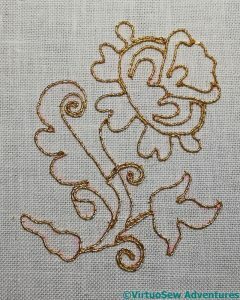 The first stage in this case is to work outlines in gold, and on this occasion I deviated slightly from the instructions. 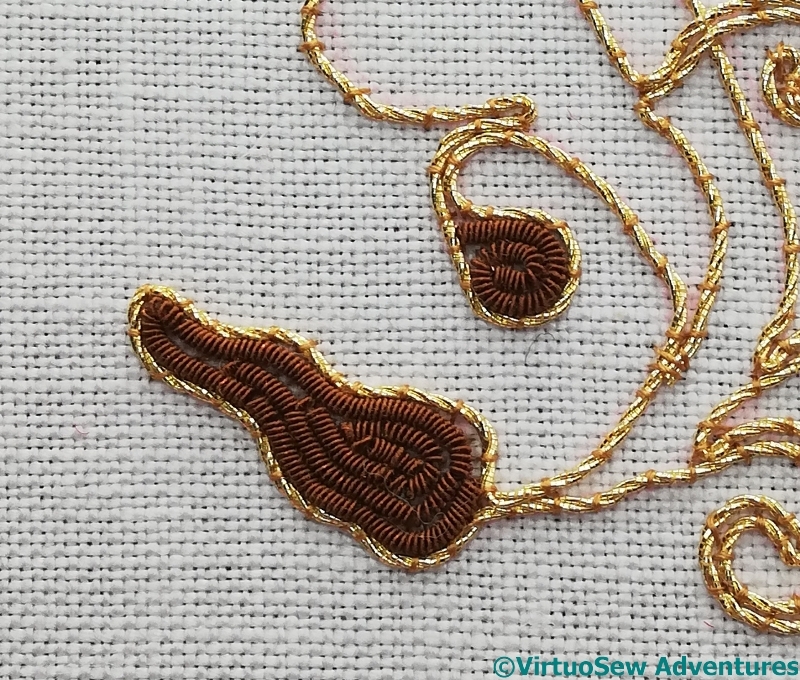 Normal practice these days is to plunge the ends of the gold thread and sew them down at the back, but it used to be more common simply to cut the thread and oversew it firmly on the front. So I’ve done that. 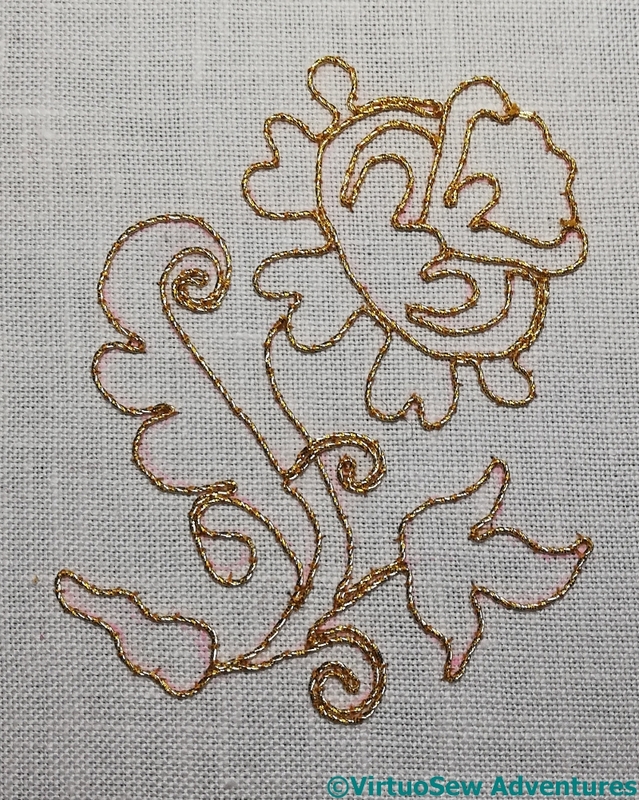 It saves a bit of the expensive gold thread, and as this is a small decorative panel and not for a garment or other item which will move a lot, I think it will be successful. 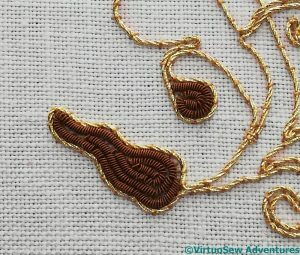 It’s still important to run the thread in the right way over the design to minimise the number of cuts, of course! The final part of the first month’s instructions is the first element of the silk purl, couched in a spiral to fill a pair of leaf shapes. You can see that I have rather crushed the silk purl into place, which is a pity as it has introduced breaks or cracks into the purl, but then, this is an extreme close up. Without a magnifier, it is simply an impression of colour and texture. The spiral is worked inwards from the gold outline, which is probably the only way it could be done – imagine the difficulties of finding the right central point to start from!